Now that summer’s finally here, people will be dragging out their cameras and dusting them off in the hopes of capturing some fun summer photos. Unfortunately, the results of these warm-weather photo shoots are often a little disappointing. The reason for these less-than-exciting pictures is that most photographers seem to think they must follow a set of rules when taking photos. Nothing could be farther from the truth. 1. Don’t center your subject. Framing a shot is not like aiming a gun. You don’t need to center your sites on the target. Imagine a set of crosshairs on the photo. Now instead of using the crosshairs to center your subject, use them to place your subject on either side (or above or below) the center of the picture. 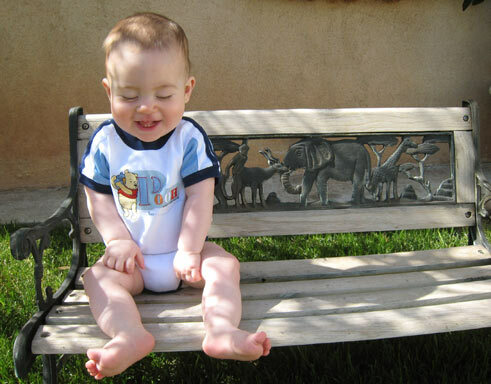 The baby on the bench in an example. 2. Knock it off kilter. Instead of taking the typical “photo-taking stance” with feet shoulder-with apart, etc, etc, try a radically different position. Get down on the ground, stand on a chair, or tilt your camera at a diagonal to find an interesting new perspective. 3. Stop shooting scenics. People flip through scenic pictures faster than light can travel into your camera lens. To make your scenic shots more exciting, put something or someone in the foreground. This adds depth to a photo and creates human interest. 5. Shun sunny days. Our natural response to sun-shiny days is to grab the camera and head outside. Yet full sun can create unsightly shadows and squinty eyes. Overcast days offer a far softer and more flattering light for taking pictures. 6. Chop off the head. We’ve all made fun of photos where freakishly-tall Uncle Al’s head has been cut off, but sometimes “chopping” off part of the photo can be a good thing. Picture-takers tend to include too much stuff in their photos. Zooming in closer and creating a tighter shot can create a less-cluttered photo. Children’s faces are wonderful subjects – as long as you have the eyes, you will get a great shot.